I’ve had this recipe figured out for months. I’ve made it for family, for friends, and for my 1st annual Halloween Zombrunch (with a bloody cherry sauce drizzle). Everyone that’s tried it has loved it, including my gluten-eating friends. But, I haven’t posted it to the blog yet. Why not? Because it has refined sugar and eggs in it. And, that’s against “the rules.” I hate rules. They’re sucking all the fun out of blogging. So, here’s the new blogging rule – there are no rules. That doesn’t mean you’re going to start seeing gluten and dairy and soy stuff here. Those are things I just don’t eat. No rules there. I just don’t even consider those things “foods” anymore. But, eggs, sugar (and other high glycemic sweeteners), chicken, turkey, yeast, fake Daiya cheese, even neon-colored sprinkles (egads!) – those all appear in my kitchen and on my plate from time to time. And, now, if they’re yummy enough, they’re also going to appear on my blog from time to time. Please don’t complain. The food police make me so sad. The upside is that if blogging becomes fun again, you just might see more recipes. Oh, and I LOVE a good challenge. So, if there’s a certain thing you really want to see, feel free to let me know. A friend just planted the seed in my head for a nightshade-free chili. Challenging, yes, but also could be very fun and delicious. Got a challenge for me? This is an adaptation of a recipe from my grandmother’s old church cookbook. It has a lot of ingredients and dirties multiple bowls and it’s worth it anyway. I’ve tried it with coconut sugar, but I didn’t like it as much. Feel free to use your favorite granulated sweetener and let me know how it works. Preheat oven to 350°. Grease a 9 x 13 baking pan. Mix yeast mixture ingredients together and set aside to proof. In a large bowl, beat the shortening and Earth Balance together until creamy. Beat in the sugar. Add the eggs and beat until light and fluffy. Mix together the almond milk, extracts, and psyllium powder. Add to other ingredients and beat. Don’t worry if it separates. It will be fine. Add half the dry ingredients to the wet ingredients. Beat until smooth. Add half the yeast mixture. Beat until smooth. Repeat with the remaining dry and yeast mixtures. Be sure to scrape the bowl occasionally. The end result should be smooth and fluffy. Scrape dough into prepared pan and spread evenly. In a small bowl, mix together the sugar, coconut flour, cinnamon and Earth Balance for the sugar crunch topping. When fully mixed, stir in the chopped nuts. Sprinkle mixture over the dough in the pan. Bake for 30-35 minutes, until top is golden brown and a knife inserted comes out clean. Cool before cutting. This entry was posted in breakfast, cinnamon, desserts, grain-free, nightshade-free, nuts and tagged recipes; grain-free; brunch. Bookmark the permalink. Brilliant! yes I am a new type 1 but that doesn’t mean I cower to the food police. it is my responsibly to be careful of what I eat and choose wisely and no one else’s. I enjoy when people cook to suit their needs and then freely share. I look forward to many great recipes. This one will appearance at breakfast on Thursday, my daughter’s 16 birthday. Thanks for making me look good in the kitchen. Yay! So happy to hear that you’re pleased with the new no rules policy. 🙂 I hope your daughter loves the coffee cake. Holy yum Deanna! This looks awesome. I keep meaning to make a coffee cake. The husband won’t eat almonds, and I’ve been having trouble with swapping other nuts (he isn’t a big fan of hazelnuts either) since the fat and protein contents differ. Have you had luck with any other nut in baking? I’ve also done some baking with both sunflower seeds and pumpkin seeds, but wouldn’t recommend either for this unless you want a green coffee cake. Aw, thanks so much, Shirley. Yep, the yeast doesn’t add much to the rise, but it does add to the flavor. I have so many of old family/church/community recipes that use yeast – some that let the dough sit overnight. I want to try a grain-free overnight yeast recipe soon. It’s fun to play with traditional ingredients. Your cake looks awesome! If your recipe is good why not post it? I love that your not letting rules stop you! Oh dear I didn’t realise it, but I have been breaking all the ‘rules’ too then! I will definitely choose to bake your lovely sounding cake though, and snap my fingers in the face of the food police! 🙂 Yummo! Those darn rules, eh? I’m so glad I’m not the only rule-breaker. Welcome to the club! I was so excited to make your recipe, printed it out and started getting out the ingredients and then realized it was grain free. I’m not very experienced at baking grain free, so I fumbled a bit to see if I had the required ingredients. As it turned out, I made some almond flour and coconut flour in my mini food processor, and had to sub in some brown rice flour for about 1/2 cup of almond flour, but it still turned out super yummy! It was a little crumbly. Is your version crumbly? This isn’t a challenge, but would you mind putting “grain free” in the title of your recipes that are actually grain free? Not all of us that are gluten free feel obligated to get on the grain free bandwagon yet, and don’t want to get caught without the right ingredients for a very yummy looking recipe. Thanks so much for all you do! Brown rice flour is super drying, so my guess is the crumbly came from that. As written, it has a very moist crumb and holds its shape well. Homemade almond flour and coconut flour are also probably more coarse than the purchased stuff, which could alter the texture, too. I put “(grain-free)” in the title. I had used that designation on Facebook and such when I promoted the recipe, and I usually include it in the title, but apparently didn’t think of it for this one. I don’t do everything grain-free, but I’ve found that for a lot of things, I prefer the flavor and texture of grain-free over the gluten-free grains. I’m glad to know that it mostly worked with your substitutions. I encourage people to sub in whatever works best for them. It’s fun to experiment with baking! This looks and sounds delicious. Son can’t eat almonds. Any suggestions on substitutes for the ingredients with almonds in them? Cashews would be my first suggestion. Can he do cashews, or is it all nuts? It’s possible that you could use a grain-based flour in lieu of the nut flour, but I can’t give you exact measurements or anything. For the almond milk, any milk would do – rice, soy, coconut, or cow. 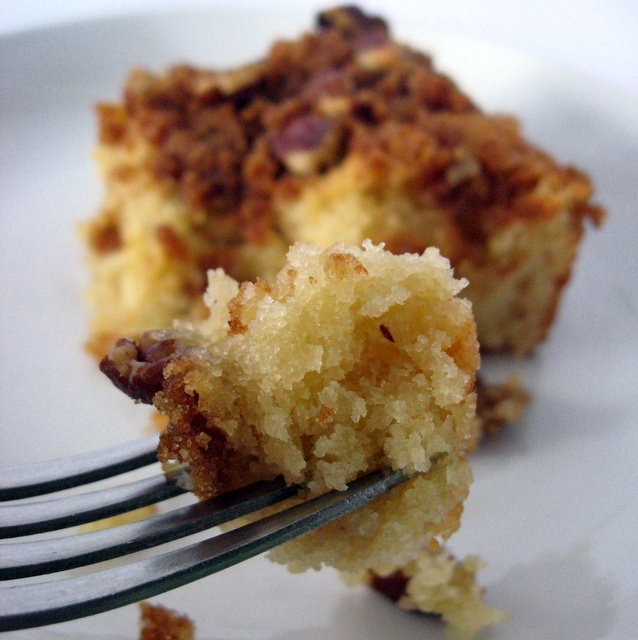 This is a FANTASTIC recipe and I know because I have eaten the goods! Not sure I can make this one without some help on knowing some of the ingredients. I will contact you in advance when I am in a baking mood to figure it out. Oh and yes, could you come up with a nightshade free chili? Tomatoes still do a number on me and I love chili! I actually did come up with a nightshade free green chicken chili. Haven’t posted it yet, though. I’ll have to make it again and post it. The kiddo was not impressed, but I liked it and so did the kiddo’s dad. So, perhaps it’s a more grown up kind of taste. I was told that I should post this to your original post. So her it is. This looks just like a coffee cake I used to make my family before I had to go gluten free. It looks so good! I was wondering if I would be able to switch the psyllium powder with xanthan gum. I just don’t have that. A better swap would be flax seed or ground chia seed, though, if you’re really looking to swap. I haven’t tried this yet but am trying to eliminate as much gluten from my diet as possible to see if it helps my year round allergy symptoms & new acid reflux issues. I don’t know if I’ll stick w/it long term depending on results but if I do it will be nice to have some sweet treats every now & then! I can’t believe people really make those nasty comments to you or other bloggers, everyone should use their common sense & know that these aren’t meant to be eaten daily but in moderation as a treat. GF people are allowed to have junk food sometimes too! At least it’s homemade w/out the nasty chemicals/preservatives. Looks delish! Thanks for the kind words. This cake is definitely one that non gluten-free people enjoy a lot. It’d be a good pick if you’re transitioning. Good luck with your health changes!